A common misconception regarding the seasons is that the summer season is caused when the earth moves closer to the sun, and winter is caused when the earth moves farther away. In fact, we are physically closer to the sun during the winter months of the year. Earth does not orbit in a perfect circle, but rather in an elliptical, oval shape. The earth’s closest distance from the sun, known as perihelion, occurs around January 3. The farthest point we reach from the sun, known as aphelion, occurs around July 4. 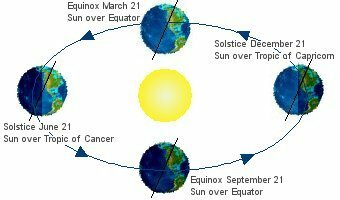 The tilt of the earth during different parts of the year affects how much direct sunlight a hemisphere receives on a daily basis. For the northern hemisphere that receives hotter temperatures during the summer months, the tilt of the earth faces them more directly towards the sun. On the other hand, those countries in the southern hemisphere will receive less direct sunlight during those months. More direct sunlight and longer days leads to hotter average temperatures, and thus a warmer summer season.